As my FiOS bill has ballooned to twice the expected amount, I figured I should check to see what of the extreme bundle I got a year ago has stopped working. After all, I do not watch much TV, and the only premium channel I care about is TrueEntourageGameOfEnthusiam. I most certainly do not use a Verizon Security/Backup bundle which apparently cost me $10/mo for the last few months. After I tried to change my plan, and got confused a number of times, I spoke to a person via live chat about canceling some channels and keeping others, but that’s a whole other post in the near future. To the survey, Batman! Without being a UX expert (and pretending I have not dealt with them over the years) I can tell right away – Verizon does not care about my feedback, and never did. Sidebar: I can see the meeting that drove this decision. “But we are chat division, we cannot be held accountable for the overall experience. This is to make us – live chat customer support – better.” said their manager in an important meeting. Other people in the room, most of whom probably live so far out of the city that FiOS is not available, nod sagely. Everyone in that room has built their careers by defending and growing their turf, not by thinking of their eventual customers’ experience with Verizon. 2. I have no idea. How does this question possibly add a value to me? I already told Verizon the service was poor or excellent. In my case the chat people are always well-meaning but useless. I would not recommend the chat service because to use it is to admit the website has already failed. I would recommend my friends use this service like the would use a fire extinguisher – a painful last resort that will add to the damage but might prevent a bigger loss. Not exactly a ringing endorsement. So why ask this? Because Verizon does not care about your time or getting useful data. They care about TPS reports. 3. I am on a website!!!! That’s clearly my preferred method. It is not any of the choices. And I cannot stand when you require me to answer a question. Are you seriously telling me that my feedback is useless without this answer? An answer to a question you could not even provide adequate choices for? Rightâ€¦ Remind myself again -Â Verizon does not care about your time or getting useful data. They care about TPS reports. 4. The only useful field on the survey. Maybe it should be the one required field. And the first one. Why not invite the user to tell you how they feel? That would tell me Verizon is willing to read what I write and think about it. But I know they won’t. They will relegate my survey submission to a disgruntled pile, find a way to exclude my ratings from their overall numbers and move on. 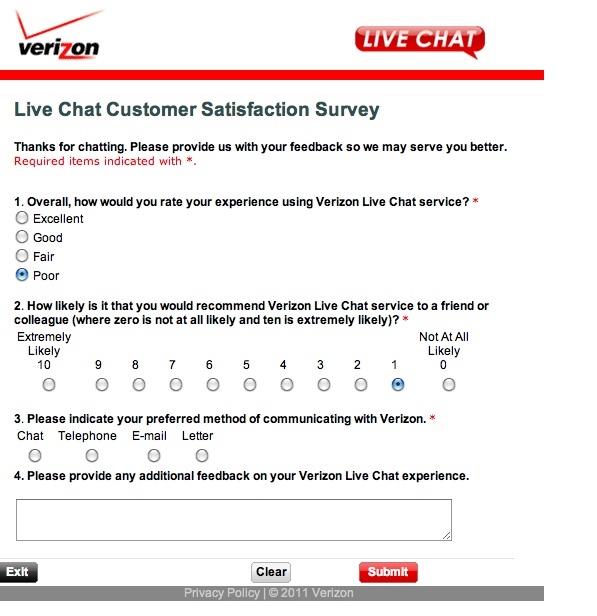 To summarize – if you have to give you users a survey, heed the lessons of Verizon. Ask the users in a manner that respects their time and opinion, else your monthly payment from these users will suddenly become $60 less. If you liked this post, read the first one I wrote on “how not to do surveys“. This entry was posted in Entrepreneurship, Web and tagged Business, Customer service, Online chat, Technical support, Verizon FiOS. Bookmark the permalink.